The 15.2k Time Trial is new for this year’s competition with 100 cyclists riding; there are an expected 200 participants for the 160K Gran Fondo and the 80K Medio Fondo. 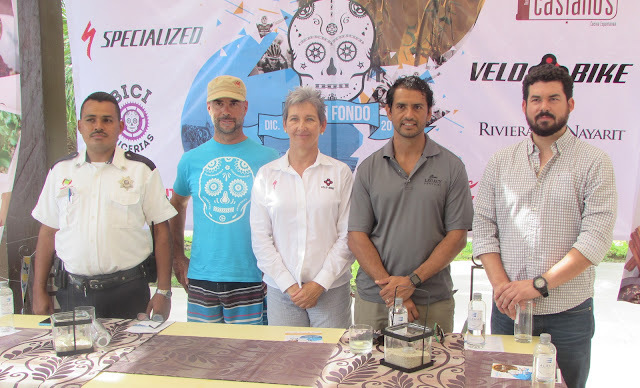 The II Gran Fondo in the Riviera Nayarit will take place December 3-4, 2016 will follow a route that will cross through the towns of La Cruz de Huanacaxtle, Punta de Mita, Higuera Blanca and Sayulita, offering cyclists amazing landscapes and secure roadways. During the November 23rd press conference Event Director Belín Villasante offered details on the event accompanied by sponsors and local authorities. She stated there is an estimated 30% increase in participants versus the first event. There were a little less than 200 participants in 2015, while this year they’re expecting approximately 300 cyclists from different states including Nayarit, Jalisco, Colima, and Guanajuato, as well as international representatives from the United States and Canada. This year’s competition will include a new 15.2K Time Trial with 100 cyclists expected to ride it on Saturday, December 3rd. The 160K Gran Fondo and the 80K Medio Fondo will be held on Sunday, December 4th with a projected group of 150 to 200 participants. The municipal and state authorities, particularly the Transit and Public Protection departments, have lent their vital support to the project, which is needed to guarantee the safety of the riders. For the two days of the event they will be in place with plenty of signage and officers coordinating the circulation of cars. It’s important to point out there will be no road closures. The Riviera Nayarit Convention and Visitors Bureau has been present since the first edition of this competition, which is expected to become an anchor event for the Destination.